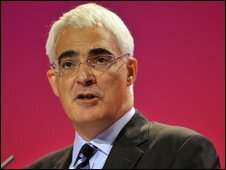 Chancellor Alistair Darling has recommended a pay freeze for 40,000 senior public servants in 2010/11. He has written to salary review bodies calling on them to freeze the pay of judges, senior NHS managers and GPs. In addition, about 700,000 middle-ranking public servants, including doctors, dentists and prison officers, will get a rise of between 0 and 1%. Unions said they were disappointed and the Tories questioned the timing of the news, during their party conference. Mr Darling's move breaks the convention about avoiding big policy statements during rival party conferences - shadow chancellor George Osborne is due to deliver his keynote speech to the Conservative Party conference in Manchester on Tuesday. Speaking to BBC News, Conservative leader David Cameron said: "What the chancellor said last night, I thought, was slightly cynical in timing and it's also quite insubstantial in content and it's not part of an overall approach. "What you are going to see from George Osborne is quite a contrast, instead of not saying something to his party conference, which is what Labour have done, you will see George explaining to our party conference, what needs to be done." People are having to manage the reduction in budget and potentially great change in the public services and frankly a nought percent increase is no way to either motivate or reward anybody. If it is fully implemented, the pay freeze would be the toughest public sector pay deal in 30 years. No recommendation about pay for the armed forces has been made. And Mr Darling's announcement does not affect teachers, nurses and police officers who are still subject to three year pay deals which come to an end next year. A Treasury source told the BBC the pay freeze will override the final year of a three-year pay deal for senior public sector workers. This means the salary rise expected next summer by GPs, judges, NHS managers and the heads of quangos will not now go ahead. And according to the BBC's political correspondent Ben Wright, the Treasury have also said the pay freezes are devolution sensitive. So the freeze for GPs applies to England and Wales, and senior civil servants who work in national organisations - such as a HM Revenue and Customs worker in Scotland - are also subject to the restriction. But if someone works in the Scottish health department the pay freeze does not apply, our correspondent added. Jonathan Baume, general secretary of civil service union the First Division Association, said a pay freeze was not the right move. "These are staff who are doing very demanding jobs at the moment. "We recognise there is a very difficult fiscal situation - there is a crisis in the public finances - but people are having to manage the reduction in budget and potentially great change in the public services and frankly a nought percent increase is no way to either motivate or reward anybody." The British Medical Association said it was not right to penalise frontline NHS staff "especially as many of them are under the pressure of more work during the recession. "There are other more effective ways of making savings in the NHS." Meanwhile, the ongoing debate over public spending has seen the Conservatives announce plans to make millions of people now in their fifties work for an extra year before they get their state pension. Mr Osborne is expected to say during his speech that he would raise the state pension age from 65 to 66 from 2016 if the party wins the next election to help tackle the UK's debts.